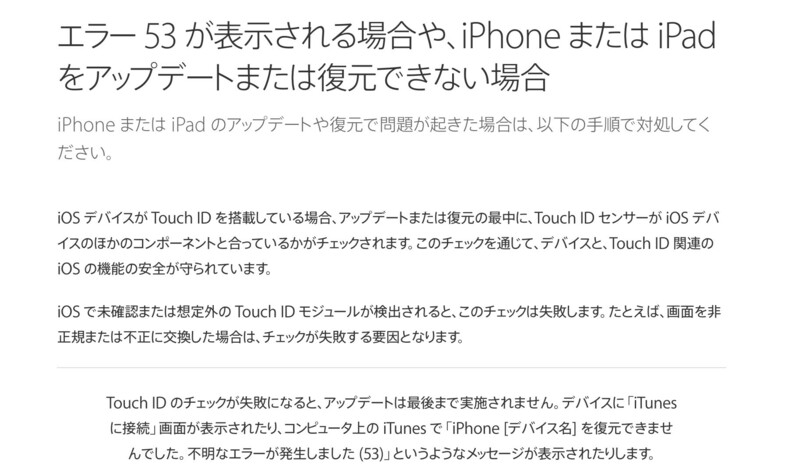 iPhone 6シリーズのTouch IDを非正規の修理サービスに依頼するとiOSアップデート時に「エラー 53」というメッセージが出てiPhoneが復元できなくなる可能性。 | AAPL Ch. Error 53 seems to affect iPhone 6 or 6 Plus users—and possibly other Touch ID enabled devices (the jury is still out on the 6s and 6s Plus, which have a different cable design). Sometimes, the error crops up after an accident that somehow affects the home button or home button cable. But more often, Error 53 affects users who have done repairs involving the home button/cable, either on their own or through a third-party repair tech (read: not in an Apple Store).